Hi everyone! I am Jolie named after the always beautiful Angelina Jolie because of my thick and luscious kitty lips! Maybe as far as appearance goes that is all I have in common with Angelina, but no one scores higher than me for inner beauty! I am extremely friendly to all people and would make an excellent greeter when you come home after a long day. My charm never fails and I definitely have the charisma of a Hollywood starlet! I am 10 years young, and have plenty of energy. When I am not in your lap getting snuggled with I will happily be playing with my favorite toys (mainly those filled with catnip!) and exploring my environment. Because I used to live in a sticky situation with WAY too many cats I will do better in a house as the only friendly feline. 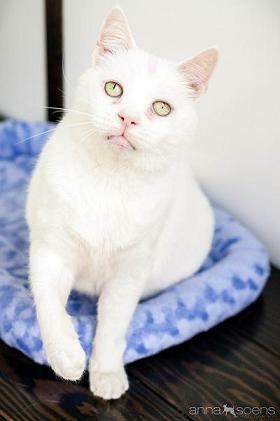 Do I sound like just the stellar cat you were looking for? Well come check me out! I am currently living at the Pixie Project. I am fixed, vaccinated and microchipped. My adoption fee is $100.